The objectives of physical therapy include: prevention of disability and pain, restoration of function and relief from pain, promotion of healing, and adaptation to permanent disability. Physical therapists work with patients to maximize movement and flexibility while helping them build strength and endurance for improved muscle control and balance. Physical Therapy's ultimate goal is for the patient to achieve freedom from pain, independent living, and an understanding of how to prevent re-injury. Speech-language pathologists and audiologists work with those requiring specialized help with communication, swallowing or hearing. For speech language pathologists, assessment methods, including standardized tests as well as special instruments, are used to analyze and diagnose the nature and extent of speech, language, and swallowing impairments. An individualized plan of care, is then developed, tailored to each patient’s needs. The pathologist teaches individuals how to strengthen muscles or use compensatory strategies to swallow without choking or inhaling food or liquid, helping nursing home residents and apartment tenants recover reliable communication and swallowing skills. Audiologists work with those suffering from hearing, balance and related ear problems assessing the nature and extent of the hearing loss or other related difficulties. In conjunction with physical therapists, they determine a treatment plan for those with balance problems. For those suffering from hearing difficulties, they determine the level of hearing loss and prescribe the appropriate assistive devices where necessary. 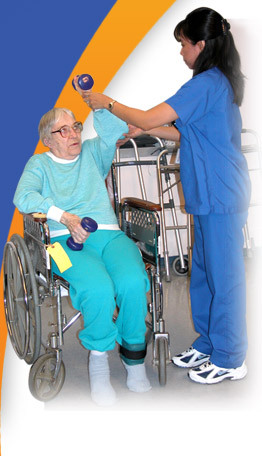 Occupational therapists work on activities of daily living, helping nursing home residents, apartment tenants and day center clients with the skills needed to complete simple tasks most people take for granted such as making a meal, putting on shoes or buttoning a shirt. Therapists offer skilled treatment to help individuals achieve independence in all facets of their lives. 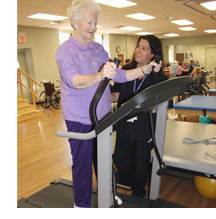 Care includes customized treatment programs to improve one's ability to perform activities of daily living and performance skills assessments and treatment. 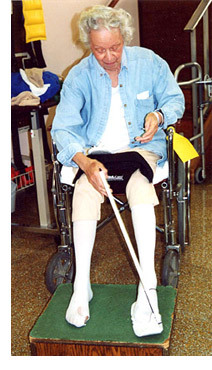 Rehabilitation medicine plays an integral role in improving the daily lives of our nursing home residents and apartment tenants, promoting independence and mobility while giving them the skills necessary to remain as self-sufficient as possible. For more information, contact the director of rehabilitation services by clicking on the link or by calling 973-253-5255.